Quick: name the three largest known objects in the Kuiper belt. If you’ve been paying close attention you will instantly get Eris and Pluto, and, if pressed, you will admit that no one knows which one is bigger. And the third? An unscientific poll of people who should know the answer (my daughter, my wife, my nephew) reveals that not a single one does. The answer, of course, is Makemake (you remember how to pronounce this, right? Mah-kay-mah-kay, Polynesian style). Makemake was discovered just months after the discoveries of Eris and of Haumea, and all were announced within days of each other. Eris and Haumea had important stories immediately attached to them (Eris was as big as Pluto! Haumea had suspicious discovery circumstances! ), so poor Makemake stayed in the shadow of its more famous contemporaries. It was so overlooked that, in the hastily called press conference in which we announced the discoveries, I couldn’t even remember the official designation of Makemake when asked (it was 2005 FY9, of course; how could I have forgotten that?). In the nearly 8 years since its discovery, we’ve learned more about Makemake, and it has become a critical Rosetta stone for understanding Kuiper belt atmospheres and outer solar system chemistry. It’s not overlooked anymore, but it still hasn’t had the massive scientific attention of Eris, with its large size and density, of Haumea, with its crazy spin and family of shards that it spread throughout the Kuiper belt, of Sedna, with its distant orbit unexplainable by anything currently known in the solar system. So I was very excited to recently find a scientific paper describing the first observations that would have a chance of discovering something truly special about Makemake: that –perhaps – it has the largest atmosphere in the Kuiper belt after Pluto’s. The observations were a stellar occultation (which I describe in detail earlier for Eris), which happens when Makemake passes in front of a star. When it’s in front of the star, Makemake essentially makes a shadow on the Earth of its size. The shadow races across the Earth as Makemake moves across the sky. If you can measure the size of the shadow, you can measure the size of Makemake. And, even better, if you can determine whether the shadow has hard or soft edges, you can detect whether or not there is an atmosphere. There is no way to observe the whole shadow at once, but, instead, telescopes watch the star blink out and then reappear as the shadow crosses across them. If you have a network of telescopes you have a good guess of the shape of the shadow. It’s an excellent technique, but hard, as Makemake doesn’t occult stars very often. Alas, in this case, the observations were not quite sensitive enough to detect an atmosphere – that is, to tell whether or not the sides of the shadow were fuzzy – but, instead, they did allow a very precise measurement of the shadow’s size and shape. I started reading the paper already knowing that no atmosphere was detected, but curious about the measured size and shape. And then a funny thing happened. The paper said that they had measured the density of Makemake. I was a bit surprised. Density, as you remember, is the mass of the object divided by its volume. I have been working hard for a lot of this decade trying to measure densities of dwarf planets because, in the end, densities tell you what an object is really made out of. In the convenient units that we use in the field, frozen water – which is abundant in the outer solar system – has a density of about 1 gram per cubic centimeter. Rock is close to 3 g/cc. The density of the Earth is about 5.5 g/cc, telling you that there’s something heavy down below – a core of iron in our case. The density of Saturn is only 0.7 g/cc showing that it really is gas almost all the way down. 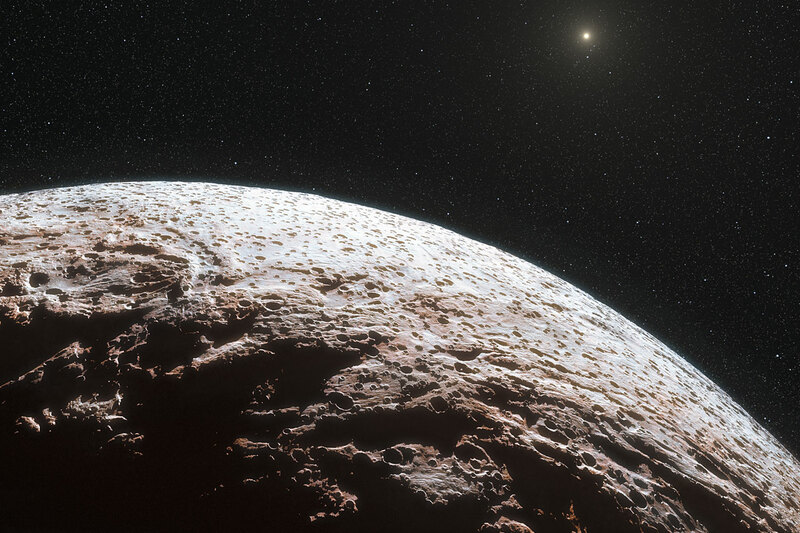 In the Kuiper belt it has long been known that Pluto has a density of about 2 g/cc – meaning that it is composed of something like half rock and half ice. Sure, there are other things around, but, really, if you want to understand the basics about what an object is and where it came from, knowing how much rock and how much ice is truly the main thing that you want to know. When we first started discovering objects in the Kuiper belt, we expected them all to be made of the same stuff and thus have the same densities as Pluto. One of the quick surprises, though, was how much variation there is. Haumea and Eris are both closer to 2.6 g/cc (much more rock! ), small objects are closer to 1 g/cc (almost all ice). Objects in between are… well… that’s one of the critically important questions. Do densities smoothly increase as objects get bigger? Are densities modified by giant impacts of the types that form satellites? I would love to know the answer. One way to help answer the question would be to measure the density of an object that didn’t have a satellite. If giant satellite-forming impacts blast away ice and leave rock and thus make high densities, then objects without satellite will have systematically lower densities. It’s a nice little easily testable hypothesis. Except for one problem: we can’t easily measure the densities of objects without satellites. Density, again, is mass divided by volume. Volume we get by measuring the size – as in these occultation measurements. Mass, to date, we have only gotten in one way: find a satellite and see how long it takes to go around the Kuiper belt object. Simple high school physics then tells you the mass of the central object. A massive central object will cause satellites to whip around quickly, or keep even distant satellites in orbit. A less massive central object will cause slow lazy satellite orbits. The measurements, in this case, can be very precise. This is how we know, for example, that Eris has a mass that is 28% greater than that of Pluto. Makemake has no known satellites, and I’ve looked hard with both the Keck telescope and the Hubble Space Telescope. If there is anything there it must be really really small. And without a satellite, there is no way to directly measure the mass of Makemake. With no mass there is no density. Yet, right here, in the abstract of the paper, the value of the density is measured and it is 1.7 g/cc with an uncertainty in either direction of 0.3 g/cc. So there is the answer. Makemake has lower density than the objects with satellites. So it must be that giant impacts do blast ice away and leave dense rocky cores, and Makemake hasn’t had one of these giant impacts or it would have left satellites – which it doesn’t – and also a high density, which we now know it doesn’t. Except. Wait. How exactly did they measure the density when there is no satellite? In fact, how did they measure the density from these stellar occultations at all? In fact, what? It’s probably not worth going into detail the ways in which the alleged density measurement in the paper is both flawed and wrong. Many papers get published that are flawed and wrong. If you have never written a scientific paper that is flawed and wrong you have probably not written many, if any, scientific papers. It’s OK. That’s the way science works. Someone writes something that they think is right, someone else disagrees, the conversation continues. The next time someone writes a paper about the subject they might mention an alternative interpretation. We all move on. The density measurement wasn't even a major focus of the paper. The atmosphere was. And, to me, that analysis looks solid. But I couldn't overlook two things. First, the paper claimed a density measurement which was, quite simply, wrong. Not just the wrong value, but a value that we currently have absolutely no way of knowing. Second, the density of Makemake – the thing that they claimed to have measured but could not possibly have – matters immensely. I don’t think they knew how important this measurement was or perhaps they would have been more careful, but, to me, the density of Makemake is one of the key measurements that explains how the whole outer solar system put itself together. I concluded that I really needed to write a paper correcting the flawed paper. It's an unpleasant task, for although everyone has written papers before that are flawed and wrong, no one likes someone else pointing that out. Scientists are human. Scientists get feelings hurt, get embarrassed, get mad, hold grudges, do all of the things that humans do. The good news, if there was any, was that in reanalyzing the data myself, I came up with some pretty cool statistical methods that no one had yet applied to occultations. So the paper wouldn't just be a "these guys are wrong" paper, it would also be a reanalysis describing a better way of analyzing any such data in the future. And then for the really bad news. The first author of the paper was Jose Luis Ortiz. 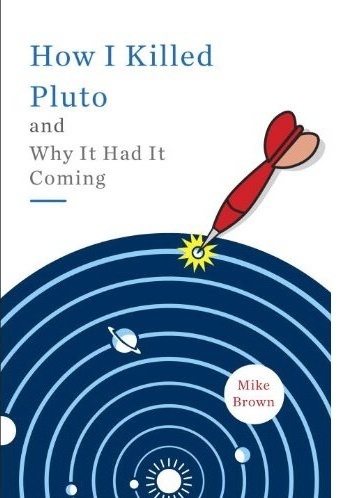 In case you have forgotten your recent outer solar system history, Ortiz was the alleged perpetrator in the Great Haumea Caper (I just made that name up, but I kind of like it. I should mention that, still, nearly 8 years later, I can't really tell you what actually happened for sure. Wish I could.) And it is really really easy to believe that I would take great delight in publicly slamming a scientific paper that Ortiz wrote. And that I would take tiny flaws and try to make them sound worse than they are. But none of this is true. I would have been much happier had the original paper simply been correct. I would have been happier if he had realized himself that his data contained no density measurement. I would have been happier working on my real projects rather than having to correct this one. But none of that happened. And I care what the density of Makemake is. And I don't want anyone to look up the Ortiz paper, read about the density measurement, and go off making up hypotheses for the outer solar system based on a measurement that is not just wrong but, with the current data, impossible. So I wrote the paper. It came out in the Astrophysical Journal Letters the other day. If you don't have a subscription, you can read the archived version for free on arXiv, the place that most astronomers and physicists post papers so that all can read. I wish I could also give you links to the Ortiz paper, but, alas, there is nothing publicly posted (I was wrong; see below!). So you'll just have to take my word for it. I find that unfortunate, because I think it would make interesting reading to compare them side-by-side and find where Ortiz went wrong. But, for most of you: tough luck. What next? Well, while thinking hard about all of this, it occurred to me that there is a way to measure the density of Makemake. It will not be easy. It'll take observations from the ALMA millimeter array in South America, more stellar occultations, and a precise determination of Makemake's rotation speed. But I think, in principle, all of those could happen. Stay tuned. Eventually this flawed claim of a density measurement may have been the thing that spawned the seeds that allow the density to finally be known. Stranger things have definitely happened in the outer solar system. @Vagueofgodalming in the comments below points out that you can indeed read the Ortiz paper in a version archived by ESO. Which is great. Sadly, however, you still don't get the whole story because almost all of the real details of the paper are hidden in the "supplementary information" that isn't included here (UPDATE #2: You CAN get the supplement directly from Nature. Which is just plain weird. But here it is). The journal Nature, in which this appears, has stringent length limits in the actual journal, but lets you add as much as you want in the supplementary information. I can imagine that at one point the information in these supplements was really supplemental. You could learn more by reading it, but you didn't have to read it to have the point of the paper proved. This is no longer the case. The supplements are critical to the arguments in the paper, so, as you either have to keep flipping back and forth to figure out what is going on, or, worse, you never bother to read the supplement so all you are really reading is an extended abstract that never really proves the points the paper is trying to prove. Or the supplement is just wrong but the fact is missed in peer review because the reviewer didn't bother to take the supplement that seriously. As you might have guessed by now, I find papers with "supplementary information" that is actually just "required information that doesn't fit in our print journal" to be irritating. I don't blame the paper at this point, though, I blame the journal for propagating this poor style upon us. Obviously scientists are human and feel and do all that you say (and much worse things sometimes) but something that most don't do is to reach out to the rest of the World and share with us what's going on in the academic sphere. You are one of the rather few exceptions and for that I am very thankful. Mike, I respect and understand your feelings about Ortiz, complete with your need to correct the data while wishing you didn't have to. That's a tribute to your humanity, and it's the reason why people like you - beyond respecting your work and generosity of spirit. As for 'the Great Haumea Caper,' that's just a great name. A shenanigan with a side order of pineapple? Who wouldn't love that? I love reading your posts, and will look forward to the resolution to this MakeMake question. Thanks for sharing! http://www.eso.org/public/news/eso1246/ is the news release it's linked from. Why is it that astronomers can know things about objects very far away - distant galaxies from almost the dawn of the universe, planets around other suns, etc - but you have such a hard time finding stuff in our own solar system? It seems to me that closer things would be much easier to see than distant ones. I'm amazed we're stilling finding stuff in our solar system. I appreciate your attention and time, if you get around to answering this. Imagine you had a small fly held out 100 feet away. You might not even know it were there. Now imagine a big billboard advertisement 1,000 feet away. You can definitely know a lot more about the billboard than you can the fly. Galaxies have angular diameters and brightnesses that are much, much greater than Kuiper Belt objects. I have been subscribed to "Mike Brown's Planets" RSS feed for a few months, as well as various NASA feeds and my local "Oxford Mail"(UK) news, this latter coming from just 3-5 km distant. To my surprise Mike's feed arrives before my local news, despite being from Pasadena(?). Any explanation as to the location of the RSS feed, please? OR has Pasadena got a really REALLY fast feed? If you're talking about how long a feed takes to load when you try to view it: it's probably different server loads, speeds, and locations. Mike's blog is hosted by Blogspot, and his feed is on FeedBurner (and both services are run by Google), so maybe they have more, closer, and/or faster servers than whoever hosts NASA's and the Oxford Mail's feeds. Why are most, if not many Kuiper belt worlds covered with an icy crust/mantel anyway; are the ice blankets the result of comets slamming into a terrestrial world or some other force? What conditions must be present for a world to have and maintain an atmosphere and what conditions must be present for a world to hold onto surface water; I ask these questions because few (Solar System) worlds have either feature, let alone both? Is it density, mass or perhaps gravity that is a key factor in determining if a body can have (hold onto) an atmosphere and/or water? An astronomy teacher at a local college told me that even though the Solar System was showered by comets consisting of water ice (and presumably striking most of the terrestrial worlds at one time or another with significant quantities of water), only worlds large enough to hold onto the water did so, while the rest lost most or all of their water due to being lost into space. Since there are no known terrestrial worlds within our Solar System that have as much volume/size, mass or density as Earth, is it plausible to even consider any water being discovered in significant quantities (on a terrestrial world, in our Solar System) to support life? Is it reasonable to assume that smaller worlds (low volume), especially those with low mass and density would likewise have nothing more than a "light" and perhaps dissipating atmosphere, if any? Is it reasonable to believe that a world without an atmosphere would not be able to hold onto surface water? Is it reasonable to believe that a world with surface water is also more likely to have an atmosphere? Under what conditions could a world have liquid water on its surface, but no atmosphere? Regarding density, not all natural moons are remnants of material that was blasted (ejecta) from its parent world; some objects, such as those orbiting gas giants are clearly victims of their primary world's gravitational influence. Although it may be convenient (to determine the density of an object) to have moons loitering around a primary body, perhaps such moons may have simply drifted into orbit of their parent world. It does not appear that any Kuiper belt object is a gravitational powerhouse, but it seems a false assumption that all or even most satellites are the result of cosmic impacts by "lesser" objects. What ratio or percentage is it regarding high density minor planets (dwarf planets ) to ones with their own moon(s) and vice-versa? Can scientists determine the composition of moons in the Kuiper belt, i.e. are they mostly (irregular "shards" of) ice, mostly rock/metal or some combination of the two, maybe similar to their primary world? By the rapidly mounting discovery of moons that orbit primary asteroids (Dactyl/Ida and Petit-Prince/Eugenia for example), it seems quite ordinary, even ubiquitous for even a small world lacking much mass, to have companions. If a minor world can hold onto a moon, one would expect that if such a moon resulted from another body such as a comet or asteroid striking it, that a ring(s) of icy and/or rocky debris would form around the primary world much like smaller versions of Saturn; but no such rings have been discovered around any minor worlds, to my knowledge. If I am not mistaken, the primary factors governing presence of liquid water on an object's surface has to do with *both* temperature and atmospheric density. An object with no (or insufficient) atmosphere will certainly *not* have liquid water remaining on its surface. Also, an object that is too cold or too hot will not have surface liquid water (unless it happens to have an extremely high atmospheric pressure that can force super-heated water to remain liquid). Now, subsurface liquid water is another matter entirely. That should depend only on temperature, since the solid material above would provide the density needed to keep the water in liquid form. Titan may have water, whether it is liquid, vapor and/or frozen solid, is yet to be detected. It seems that not too long ago astronomers thought that any terrestrial body beyond Mars harboring water would almost certainly be in the form of an ice cap, frost, ice sheets or frozen crust. Now scientists believe that a world such as Titan could have liquid water on its surface due to either or both of the following conditions; internally generated heat (such as from radioactive decay [of Uranium])like that of Earth's magma mantle or heat caused by friction that is generated when Titan is close to Saturn, then relaxes when the moon moves further away from its ringed primary world. I am sure that if liquid water exists on Titan that real estate values will be highest along the coast. Titan has been found to flex 10 times as much due to gravitational tides as it would if it were a rocky body. Because of this, it has been speculated that Titan might have a liquid water mantle. This would be in keeping with what I said above about subsurface liquid water. Titan also certainly has enough surface air pressure to keep water liquid, but I doubt that it has the surface heat to keep water from freezing on the surface. On the other hand, it is possible that something akin to an antifreeze mixture could be present, which would not be pure liquid water.. There is some evidence supporting the presence of cryovolcanos on Titan (as well as on Triton, Europa, Ganymede, Miranda, Enceladus etc. ); however with a significant atmosphere, internally heated water could be expelled up through fissures in the mantle/crust and erupt into the atmosphere and freeze (perhaps similarly as when you put liquid water into a bucket and hurl the water into crisp [winter] air and watch the water instantly freeze and fall as manmade snowflakes here on Earth). Titan may also have a complex hydrological cycle that no other world other than Earth has been known to have which may contribute to its ability to harbor life. Even with rapid loss of surface heat from Titan's frozen surface, internally heated hot spring water could make its way to the surface and remain liquid for an undeterminable period of time, especially during Titan's "summer." Another interesting place where liquid water may exist is on the dwarf planet Ceres. It is possible that Ceres has a thick ice crust (5 to 10 miles thick) which may trap heat from the Sun and warm the water in its upper mantle or lower crust. Being much closer to the Sun than Titan and potentially having (liquid) water, leads some to believe that Ceres has a better chance to harbor life than Titan or even Mars (because of its lack of [liquid] water). Because of the possibility that life exists on either or both of the above worlds, I believe that extreme care needs to be taken when exploring such places, as I support exploration from orbit but fear that contamination (from surface exploration) may foul their astro-ecosystems. Interesting new information that answers (and explains) some of my questions, that was published several days prior (April 18, 2013) to my last post. Two planetary systems contain three super-Earths (Kepler 62e, Kepler 62f and Kepler 69c; the Kepler designation is from the Kepler mission) that all orbit Kepler 62, a K-2 dwarf star. The reason the aforementioned planets are important to my questions are because a published report concerning the discovery of several potentially habitable "Goldilocks zone" planets explains why a world would have or be able to maintain an atmosphere and liquid (surface) water. Certain terrestrial world conditions that are necessary to have and maintain an atmosphere and liquid surface water include having sufficient mass to gravitationally bind the water to its surface, thus preventing hydrodynamic escape while rotation of the world must be slow enough to enable the world's gravity to overcome the centrifugal force (casting the atmosphere off into space), thus maintaining its atmosphere. Having an atmosphere is not enough, it must be not too thick or too thin; also the atmospheric pressure needs to be sufficient. Heat (internal and/or external) is needed to melt surface snow/ice but not too hot to cause the water to boil away, but in the latter case, water can be kept in a liquid form in temperatures well above the boiling and steam point (thousands of degrees) if atmospheric pressure provides a crushing condition called a "supercritical" state. What I do not understand at this point, is why are what scientists call "water worlds" or "ocean planets," where all or the vast majority of the world is covered by water (or other liquid), even if it is frozen, less likely to harbor life than a world with significant land masses? Why can't marine life thrive in a global ocean? Perhaps such a world could have a shallow body of water that permits (star)light to penetrate the water to the ocean bed where coral reefs, kelp or other marine organisms could thrive. Even on Earth, there are organisms that live deep in oceans at crushing depths where perpetual darkness prevails. I would think that a water world would almost be more likely to harbor life than a world with mostly land. Earth oceans are abundant with life and many scientists believe that most, if not all, Earth life came from the oceans. Oceans are second only to rain forests, in their biodiversity and contribute to global weather patterns, regulate global temperatures, atmospheric conditions etc. What beneficial properties does terra firma have regarding sustaining life? If land is necessary for life (or makes life more likely to be present), what ratio of land to liquid (water) is required for life or what rationale do you attribute to this notion? I've been reading through a few of the comments here after having been seeking information on why it taking so long to classify Sedna, and I decided to make a suggestion of mine a little bit more public. The possibility of discovery of another jovian or subjovian planet orbiting the sun might seem laughable to most people, but think about this: so far, all of the objects discovered in or beyond the Kuiper belt have highly elliptical orbits. Objects that stay in orbit of their parent star do not begin their journey that way; they begin in orbits that are very nearly circular. Since we have yet to find objects out there that are (a) planetarily large, and/or (b) in a very nearly circular orbit, it should be obvious that we are not seeing everything large that is actually out there. Consider this as well: imagine a jovian planet orbiting in a nearly circular orbit with a distance from the sun of about 900 AU. That planet would most likely be dimmer than Sedna was in its discovery image ( http://hera.ph1.uni-koeln.de/~heintzma/Diverses/bilder/6578.jpe ), and be moving more slowly in any discovery images than some of the background stars around it in the sky. Something is out there kicking things about, and I think that something is a large planet. My suggestion is that, should such a planet be discovered out in that region, since it would be performing a shepherding function, it should be named "טוב רעה" (tov ra'ah). This is Hebrew, and translates to "good shepherd". I don't think you can find the mass of Makemake short of sending a rocket. Remember how much trouble your friend and mine S. Alan Stern had doing that? After successfully predicting the approximate mass and orbit of Eris and Haumea, with some successful postdictions, I had, as you know, a massive miss with Nemesis. Unfortunately, the Veterans Administration found out I had posted on 2012hoax.org and I got in a LOT of trouble. I needed to change the subject. So I renewed my interest in molten salt reactors because the fuel can be continuously cleaned as the reactor is running. My contribution was spraying the salt through chlorine to remove iodine 135, a mild neutron absorber, before it has a chance to decay into xenon 135, the strongest known absorber. It was fun designing a reactor around this. But something changed the subject. Remember how much trouble Dr. Stern had with Pu-238? It's a nuclear explosive. Dr. Stern tried to alibi the substance, but the IAEA forced him to get a safety inspection sticker for his rocket. Well, guess what? The next step down on the alpha decay chain, U-234, is also a nuclear explosive. And so is the next step, Th-230. That's not too terribly alarming in and of itself, but what was really, really scary was to figure out where I could FIND some of this stuff. Thorium is more soluble in water than uranium, and there are several porous uranium ores. I was sitting next to a Google Earth hobbyist whom I had told this stuff to and said, "Let's go smoke out the bomb!". It took all of FOUR MINUTES. It's on a salt flat in a box canyon on Federal Parkland. We began Project Zeus, named after the Nike missile interceptor, to intercept any such bomb before it had any chance to explode. Mike, it's embarrassing to tell you this because you insist on careful scientific papers. I couldn't do that; if somebody pulled an Ortiz over on me, a couple of million people get killed. We wrote the Park Ranger immediately. I also contacted Dr. Charles Teal of the Nuclear Regulatory Commission. After a couple of months of studying the problem, it became apparent that such deposits are rare and would require a medium-scale mining/industrial operation to pull it off. So it's not really a problem. I needed to change the subject again, away from Project Zeus. The motorcycle project has been on the back burner ever since the discovery of Quaoar had me knowing that you would find Eris and Haumea. There was another reason. The bike is a two stroke, and you have to know how much oxygen is in the cylinder after the exhaust port closes or you will not get an inspection sticker. And I hit on it! I solved the window problem; oxygen is NOT transparent to wavelengths below 241 nm and fluoresces in softer ultraviolet. Worse, the damn thing would detect earthquakes before they happen. So instead of escaping from Project Zeus, I'm stuck in it more than ever!!! The great thing about Nature is that by reading the publicly available abstract and supplementary information, the public can learn everything in the paper without having to borrow an institutional subscription.